"This is great for a special brunch or even a quick and easy dinner. Other breakfast meats can be used, but the deli ham is the easiest since it is already fully cooked." Beat together eggs and milk. Heat a lightly oiled skillet (or non-stick pan) over medium high heat and cook egg mixture, stirring occasionally, until firm. When almost done, stir in ham, green onions, salt and pepper. Spoon 1/4 of the egg mixture on top of each tortilla. 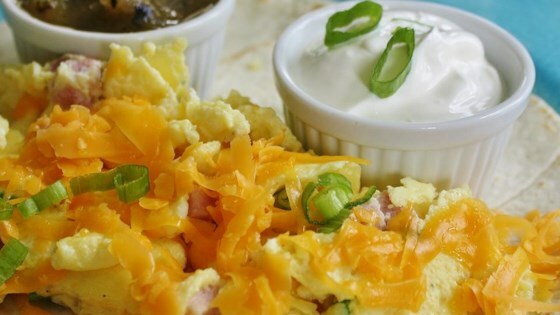 Sprinkle the eggs with cheese, fold over the tortilla to make a roll and top with salsa if desired. Try this potato-crusted egg dish for breakfast or brunch. We love these. I fold them like Chimichangas and grill them on the griddle to get the cheese good and melted. I use sharp cheddar.